As many as 23 newly elected legislators - 22 Congress and one RLD - are expected to take oath as ministers in the first Rajasthan cabinet formation on Monday. 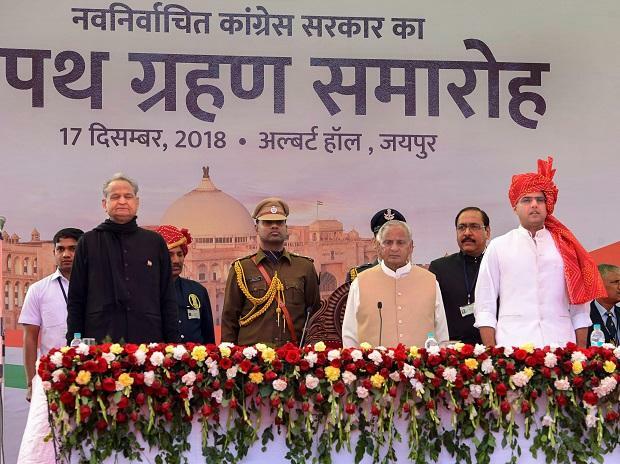 Chief Minister Ashok Gehlot and Deputy Chief Minister Sachin Pilot, who took oath on December 17, returned to the state capital Sunday noon after spending three days in New Delhi for a meeting with President Rahul Gandhi and senior party functionaries. The names of council of ministers have been finalised by the state Congress leaders including Gehlot and Pilot after rounds of discussion with Rahul Gandhi and other senior leaders, sources said. The swearing in ceremony is expected to be held in Jaipur at 11.30 AM on Monday, they said. AICC general secretary in charge of Rajasthan, Avinash Pandey and Congress observer for the state on government formation, K C Venugopal, besides AICC secretaries for the state were also involved in the deliberations for deciding on the ministers, the sources said. Rahul Gandhi intends to focus on having a cabinet with a majority being fresh faces, sources said, adding the cabinet will be a blend of the old and new guard and will give an opportunity to those who have not held ministerial portfolios in the past. They said over a dozen of them will be seen in tomorrow's cabinet expansion. Meanwhile, Gehlot has so far initiated a few transfers of officials with the likelihood of a thorough reshuffle of bureaucrats after the cabinet formation. "As many as 22 Congress and one alliance partner RLD's MLA are likely to take oath at Raj Bhawan on Monday," a party leader informed. Those who are likely to take oath are BD Kalla, Raghu Sharma, ShantiDhariwal, Lal Chand Kataria, Pramod Jain Bhaya, Parsadi Lal Meena, Vishvendra Singh, Harish choudhary, Ramesh Chand Meena, Bhanwar Lal Meghwal, Pratap Singh Khachariyawas, Udai Lal Anjana, Saleh Mohammad and Govind Singh Dotasara. Mamta Bhupesh, Arjun Singh Bamaniya, Bhanwar Singh Bhati, SukhramVishnoi, Ashok Chandna, Tikaram Jully, Bhajanlal Jatav, Rajendra SinghYadav and RLD's Subhash Garg are also likely to take oath, he said. Rajasthan can have a total of 30 ministers including the chief minister and the Gehlot cabinet will have some vacancies left which will be filled later.